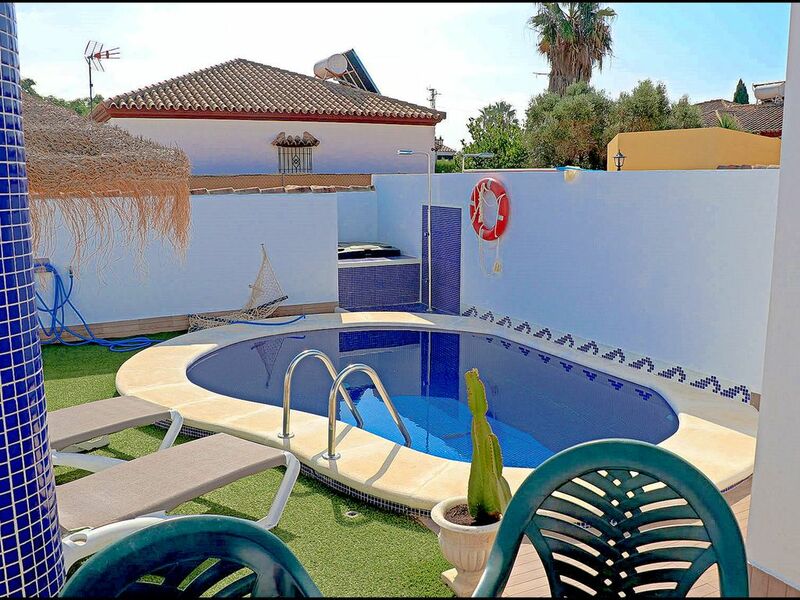 Holiday villa near to the beach area of ​​Cala del Aceite, on the outskirts of Conil. Although the beach is less than 14 minutes walk away, this villa has a private pool with outdoor shower, hose, barbecue and artificial grass area with sun loungers, tables and chairs on the terrace, for great days of fun and relaxation. It has a maximum capacity for four people and is distributed in two rooms: one with double bed and one with two single beds, a bathroom with shower and a shower screen, living room and well equipped kitchen. Free Wi-Fi connection is included. The accommodation has a portable fence that you can use as protection for small children or control of access to certain areas. It also has a garage. Pets are allowed, maximum one per booking and paying a daily supplement. Parties are not permitted in this property, it´s recommended for people looking to relax, and families with children.